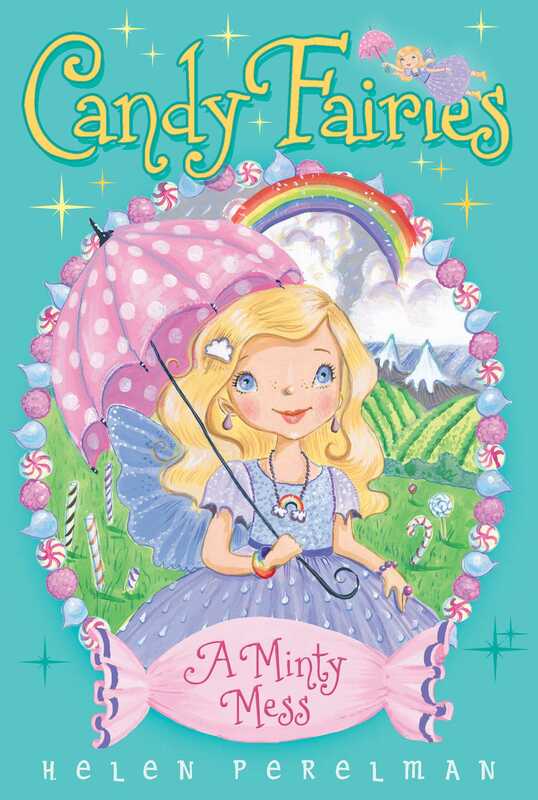 Dash the Mint Fairy wishes the soggy weather would stop raining on her parade in this sweet-tacular Candy Fairies adventure. It’s raining cats and dogs in Sugar Valley! The grounds are a minty mess and all the Candy Fairies are worried about their crops getting soaked and keeping their wings dry! But Dash is most upset about the weather. There was supposed to be a Royal Mint Jubilee at the castle and Dash and two other Mint Fairies have been working on a float for the event for weeks! But between the heavy downpour and mean words from the Mint Fairies, Dash wants to call it quits. Will Dash get to see her float in the parade—or will her dreams get washed away with the storm? Dash the Mint Fairy poked her head out her window. The rain was coming down hard in Peppermint Grove. All the candy mint plants and trees were pushed low to the ground from the heavy rain. “This is a minty mess,” Dash grumbled. She pulled the window closed and leaned back in her chair. There had been rainy times before in Sugar Valley, but this was the longest stretch of rain she could remember. It had been raining for weeks. She looked out the window again and saw a sugar fly. She let the little messenger in and read the note. Berry the Fruit Fairy had written that she would fly by soon with a surprise. Dash smiled. She wasn’t sure how Berry was getting to Peppermint Grove. During this rainy time all the Candy Fairies had to be very careful. If a fairy’s wings got wet, she couldn’t fly. Leave it to her clever friend Berry to come up with a great idea. Her friends had not gathered for Sun Dip for three days. Dash missed seeing her friends. She couldn’t wait for Berry to come. “It’s not looking so mint,” she said with a heavy sigh as she watched the rain fall. “What do you think, Hopper?” Dash asked. She put her hand out to the little creamy-white bunny she had found at her doorstep the day before. The little animal was wet and cold, so Dash had brought her inside. Once she had dried her off, she was fluff ier than Dash had imagined, and Dash decided to call her Hopper. “You don’t like the rain either,” she said. The little white bunny snuggled into Dash’s hand. “The rain had better stop if the Mint Jubilee is going to happen in the grove,” Dash said. Right now this was no place for a royal party. In five days the Mint Jubilee was going to be in Candy Kingdom. When Princess Lolli and Prince Scoop, the ruling fairy princess and prince of Candy Kingdom, told her about the plans, Dash was superexcited. A mint celebration was always a good idea! And Princess Lolli was happy to announce that her parents, Queen Sweetie and King Crunch, were coming from Sugar Kingdom for the grand party. The queen usually hosted the royal Mint Jubilee, so it was a big honor for Princess Lolli and Prince Scoop to have the party in Sugar Valley this year. Lolli planned to have a mint tea party for the royal family and the Candy Fairies in Peppermint Grove. Dash’s job was to work on the mint candy wrapper designs with Pepper and Spera. But so far, those two fairies had not liked a single one of her drawings. Dash was getting concerned about where the jubilee would be if the rain kept up. She wanted the party to be outside in Peppermint Grove with all the beautiful pink-and-white mints and green mint leaves. She held Hopper up to the window. “The rain had better stop soon,” she said sadly. Hopper twisted her little pink nose. Her long whiskers tickled Dash’s fingers. “At least we can keep dry inside,” Dash told her. “But I miss my friends. You can meet Berry soon. You’ll like her.” Dash gave Hopper a piece of mint candy to nibble on and then read a book that Raina the Gummy Fairy had given her, called The Minty Clue. Raina loved books. She even had her own library and looked after the treasured Fairy Code Book. Just then there was a knock at Dash’s door. Dash flew to the door, and her mouth fell open when she saw Berry. Berry was wearing a bright watermelon-colored poncho that covered her wings, and she was holding a huge orange-and-yellow umbrella.